Selling a structured settlement is a legal process that takes more time than you might initially imagine. While commercials might tote the benefits of cashing out your structured settlement 'right now', it can actually take anywhere from 30 to 90 days to complete all of the paperwork necessary to arrange the lump payment from your structured settlement. The longer amount of time is not entirely bad. The laws put in place for structured settlements are designed to protect you, the seller, from problems you might run into with the sale. 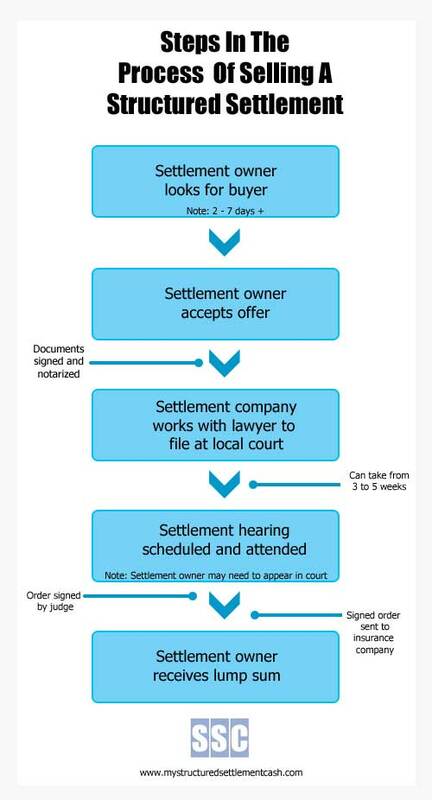 The current process for selling a structured settlement includes the period of disclosure of all the terms and conditions for selling the structured settlement followed by a waiting period so that you have time to look over the conditions. Once the waiting period is complete, paperwork called the transfer agreement will be completed before a court order. A structured settlement sale requires going before a judge to determine that the sale is in your best interest. This is the area that has the greatest amount of fluctuation in wait times, naturally. Finally, the process is complete and you have your lump sum payment in hand.